You gave me “amazing”, “be who you want to be”, and “enjoy life” as your most favorite words or phrases. I tried to choose difficult Kanji characters that could imply amazing, free, and joyful. The word “螭魅 (chimi)” should be very difficult and unfamiliar even for Japanese people. It means “water dragon (螭)” and “enchanting monster (魅)” in separate. Adding together “螭魅” means simply “monster”. But I attached one more Kanji character “力 (ryoku)”, that means ‘power’. “魅力 (miryoku)” is a quite positive phrase, that means ‘charm, appeal’, like a monster using an enchanting magic. So “螭魅力” can mean totally ‘the power of a charm like monsters’. It is the new word I created only for you. 実名公表不希望でいらっしゃるので、名前は記載いたしません。/ I don’t show their names because they don’t wish to post them on this blog. I took these Kanji from ancient Chinese philosopher Lao-zi (老子). (Rough meaning: “The road of the universe [道] gives birth to everything. The virtue of the universe [徳] nourishes everything. They grow it up, and raise it up. Kanji “育 (iku)” means ‘to raise up’. 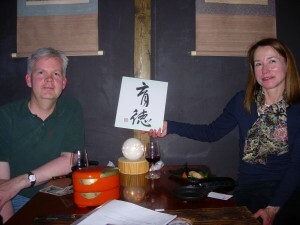 Kanji “徳 (toku)” means ‘the virtue’. I chose them from Lao-zi’s above phrase and put them in a row. “育徳 (ikutoku)” can mean ‘the virtue of raising (everything) up’. There are two pillars of schools of thought in ancient Chinese philosophy. One is Confucius(孔子)’s school (Confucianism), and other is Lao-zi’s school (Taoism). Confucianism appreciates the order of human society, on the other hand Taoism appreciates the potential the nature itself has. Lao-zi says that the universe and the nature have the authentic power to create everything, that is the virtue of the universe and the nature (徳). Lao-zi’s philosophy has become one of origins in East Asian liberalistic thoughts as well as Zen Buddhism (禅). You indicated the favorite words of you like “non-judgement”, “learning” and “evolving”. According to your request, I chose Kanji from East Asian liberalistic and nature-loving philosopher. 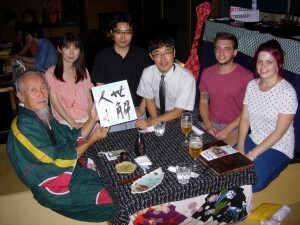 On Oct 17 we gave you our kanji calligraphy. It is “忍”. It can read in three ways – If read as “Nin”, it means a noun that can be a part of complex words like “忍術 (Ninjutsu, the art of Ninja)”, “忍者 (Ninja, it is what you well know”, or “忍耐 (Nintai, perseverance)”. If read as “Shinobu”, it means a verb to indicate ‘to persevere’. “Shinobu (しのぶ or 忍)” is also one of popular Japanese female given names. If read as “Shinobi”, it is an alternative noun for “忍者” in original Japanese language (“忍者” is a Chinese loanword). 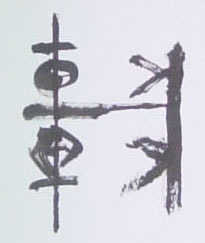 The character “忍” consists of two parts. Its upper part (刃) means ‘blade’, whose pronunciation is “やいば(yaiba)”. Its lower part (心) means ‘heart’ , whose pronunciation is “こころ(kokoro)”. It is really a suitable kanji character for Ninja, isn’t it? Japanese sword is called “刀(かたな, Kanata)” or “日本刀 (にほんとう, Nihonto)”. Katana is a one-side-blade sword, whose origin dates back to Heian Era (8c – 12c). Back to older days, Japanese sword was a two-sides-blades style, that was the standard of China and East Asia. But in Heian Era, a new warrior class started to develop. It was called “武士 (ぶし, Bushi)” or “侍 (さむらい, Samurai)”. They possessed reclaimed lands in rural areas and resorted to battles in order to keep them. They rode on the back of a horse, wore full armors, and fought each other. To fight on a horseback, a one-side-blade sword with a long reach was advantageous. So Bushi started to use Katana. It was firstly used in Eastern Japan, and spread all over the country later. After Bushi seized the power to control Japan (it was after the end of Heian Era, 12c), Katana became the supreme symbol of Bushi’s braveness and nobleness. Later in Sengoku Era (15-16c) soldiers on foot took larger roles in battles than horse-riders, and spears (槍, yari) and rifles (鉄砲, teppo) became the most effective weapons. Even so, Bushi in that era loved Katana and developed a martial art using Kanata, that is called “剣術 (けんじゅつ, Kenjutsu)”. Bushi had a rule to wear two Katana, long one and short one. The long one is called “太刀 (たち, Tachi)”, or simply called Katana. It was regarded as a weapon to fight. The short one is called “脇差 (わきざし, Wakizashi)”. It was regarded as a sword to cut enemy’s head in Sengoku Era, and later in Edo Era (17c-19c) it was regarded as the symbolic sword to take suicide to cut himself on the belly – Seppuku or Harakiri. Bushi was expected to have a braveness as well as to have a responsibility of the ruling class, so they always wore two types of Katana. “刀” is one of the simplest Kanji characters. It symbolizes the shape of a sword. Calligrapher Yagi Suigetsu drew it nicely. You told us that you two got married. You gave us your favorite words such as ‘sea’, ‘boat’, ‘sunset’, and ‘love’. I tried coining a phrase according to them in Japanese language, that could mean the new life of you two. 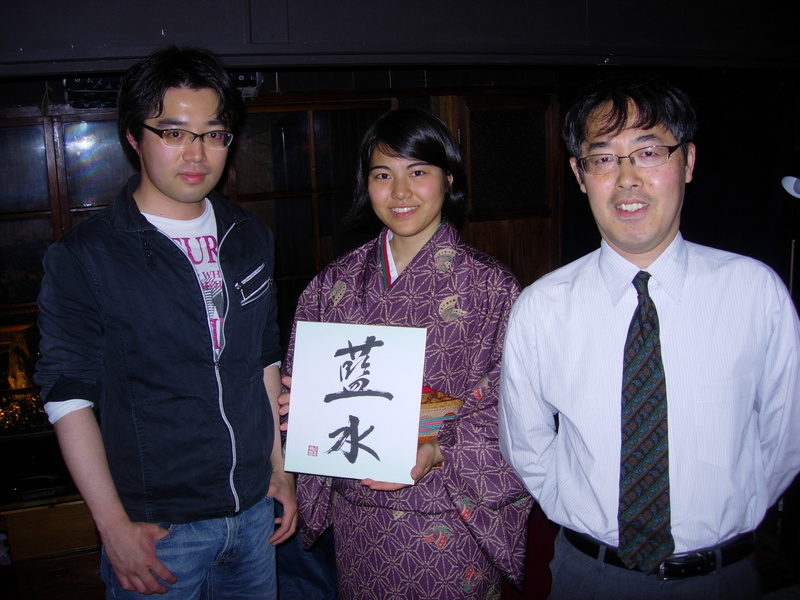 Japanese language has Subject – Object – Verb system, and it is one of agglutinative languages. Japanese phrases can be divided into nouns, verbs, and adjectives, with each of which a set of particles are stuck. That can be translated into “Raising a golden sail”. 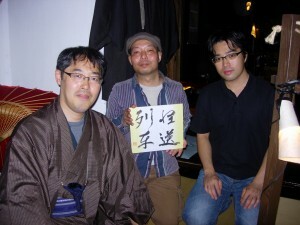 But it is too long to write it down on a small paper, so I persuaded Calligrapher Yagi Suigetsu to write its first words. Suigetsu is an excellent artist, so he wrote it in the style of traditional Japanese calligraphy　(Calligraphy was firstly imported in Japan from China over thousand years ago, and Japanese culture since then had developed it into Japanese style with the mixture of kanji [漢字, Chinese characters] and kana [かな, Japanese alphabet]). I chose these kanji characters for you according to your first and family name. I asked Calligrapher Yagi Suigetsu to write kanji in archaic style. This reads “kuruma (車, くるま)”, whose meaning is “car, vehicle, chariot / wheel”. Modern-styled kanji “車” is its simplified form. About 3,000 years ago Chinese civilization used chariots in war fields. They were similar as ancient western chariots, horses in line carrying carts with two wheels. The archaic-styled “車” represents a cart, whose right side is a yoke and left side is two wheels. As you might know, kanji is the sole modern survivor of ancient ideograms such as ancient Egyptian hieroglyphs or ancient Mayan characters. Kanji “車” is used in modern usage for not only ancient chariot, but also any vehicles – 自転車 (jitensha) means a bike, 電車 (densha) means an electric train, and 車 (kuruma) itself means an automobile car. So I chose this kanji for your family name “Carr”. Next, the total meaning of three characters. “疾如車” is derived from an ancient classic book called “Sonshi (孫子)”. This is one of famous phrases in “Sonshi”. “Sonshi” explains the art of wars, whose influence has been very much in both China and Japan. Famous Japanese warlord Takeda Shingen (武田信玄) loved this phrase and wrote it in flags of his legions. Even western Napoleon Bonaparte is said to have got interested in this book. The above phrase means how to direct your legions, in some situations you need to stand still and not to move, and in other situations you need to move fast and fight aggressively. Words of “Sonshi” are simple but have fruitful instructions, whose strategic thinking can be also applied to businesses and other activities. Your first name “Jason” should be taken from a Greek mythological hero, who sailed seas with his comrades and fought fights. So I took a phrase from “Sonshi” and modified it. “疾如車” reads “Hayaki koto kuruma no gotoshi” in Japanese. It means “Get speedy like a car”. “如” is a preposition whose meaning is “like”. All of them are written in an ancient style that can go back to three thousand years ago. You have traveled Japan long, and you said that the thing that impresses you the most in Japan is places in snow such as rural areas in Niigata. Yes, Japan has places that have snows the most in the world. You came from Florida – the origin of the name of your home State is “flowers” in Spanish. Yes, Florida is flowery and sunny. So it must be amazing for you to see snowy landscapes in Japan. In East Asian cultures there are three favorite beauties by tradition. They are written as 雪月花 (setsu-getsu-ka). That means “snow, the moon, and flower”. People have long loved landscapes with these three. 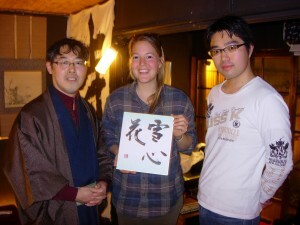 I and calligrapher Yagi Suigetsu made kanji for you through modifying three traditional beauties. It is 雪心花 (Setsushinka). 雪 (setsu/yuki) means snow. It is a beauty you came and enjoyed here in Japan. 花 (ka/hana) means flower. It is a beauty of your home State Florida. Add to them, we inserted kanji 心 (shin/kokoro) – heart. 雪心花 describes that two beauties outside wrap one beauty inside. Kanji system is the sole survivor of ancient civilizations’ hieroglyph scripts. As each character of ancient Egyptian hieroglyph had its own meaning in itself, each of Kanji indicates a unique meaning. That is different than the alphabetical system, that was created in ancient Phoenicia and spread worldwide throughout the history. “A”, “B”, and “C” have no meaning in themselves but indicate pronunciations only. On the other hand “英 (Ei)”, “美(Bi)”, and “死(Shi)” have, for example, clear meanings. They roughly mean “wisdom”, “beauty”, and “death”. Another aspect that differentiates Kanji from alphabet is its great variety. “Dai Kanwa Jiten (大漢和辞典)” is said to be the most comprehensive Kanji dictionary published in Showa Era of Japan. It contains whopping over 50,000 Kanji. Of course not all of them are frequently used by contemporary Japanese people. But the government as of now selects 2,136 Kanji to be used by Japanese in their daily life, and probably a much more number of Kanji are being understood and used by them in books and internets. 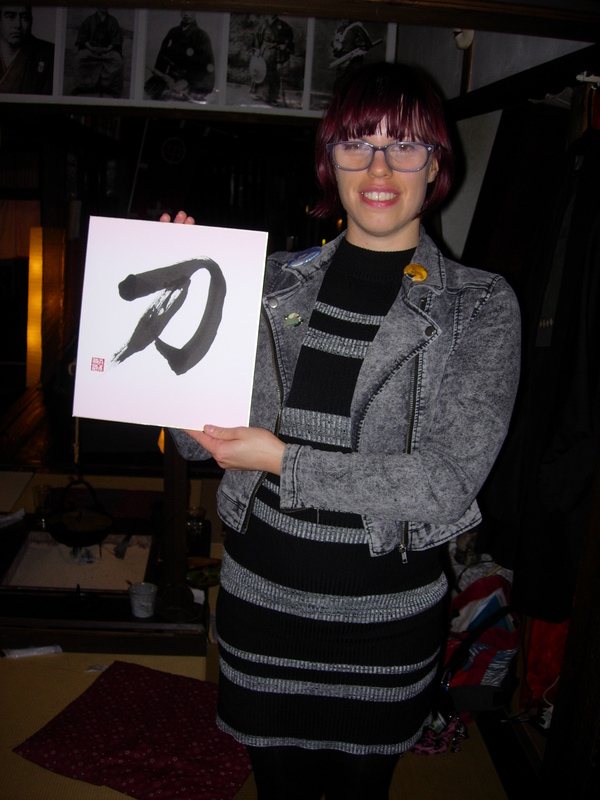 This night I picked up some of Kanji for the two, and calligrapher Yagi Suigetsu wrote them down with the East Asian traditional style of brush and ink. 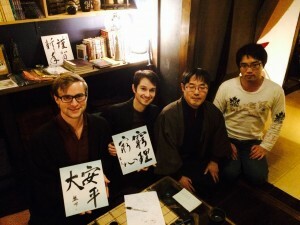 For Chase Evans-san I picked up “安平大”. I picked up this phrase from “Lao-zi (老子)”. Lao-zi is one of the most important ancient Chinese classics. It was written over 2,000 years ago. It dictates how to live our lives peacefully, as well as how a human society should be governed. Lao-zi’s philosophy should have an influence on ancient Japanese people’s way of thinking, just as Buddhism and Confucianism. “安(An)” roughly means “secure” or “pacified”. “平(Hei)” roughly means “not having a disturbance”. They have all fortunate meanings. In Lao-zi “安平大” is referred to as the state of the peace. 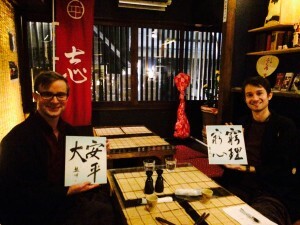 Three Kanji are so fortunate that they are frequently adopted in names of Japanese places, and also names of Japanese eras called “Gengo (元号)”. For example, Kyoto’s ancient name was “平安京 (Heian-kyo, ‘peaceful city’)”. Contemporary Japanese era is “平成 (Heisei)”, and two eras back it was “大正 (Taisho. 大 can be read either as ‘Dai’ or ‘Tai’)”. 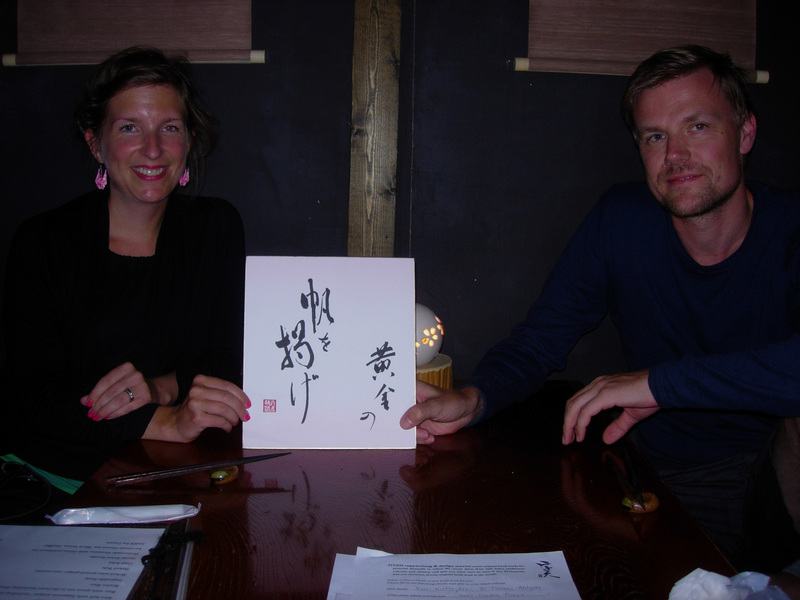 He says he loves the peace, so I and calligrapher Yagi Suigetsu chose three peaceful Kanji from an ancient great textbook. 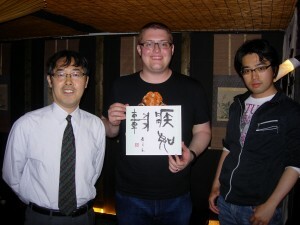 Add to ”安平大” we also tried to express his family name in Kanji. It is “盤州 (Bansu)”. “盤” means a foundation / a bedrock, and “州” means an island / a territory. When I was told by him that names of his family members had a linkage with soil and rock, I was surprised by its coincidence. “盤州” can mean a solid land that can hold cities and people…! Next, for William Curotto-san I picked up “窮理窮心”. 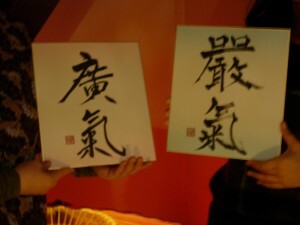 Calligrapher Yagi wrote them in two different styles. The right two are “窮理 (Kyuri)”, that are written with slightly-deformed style called Gyosho (行書). The middle two are “窮心 (Kyushin)”, written with highly-deformed style called Sosho (草書). Two “窮 (Kyu)” seem to be quite different, but they indicate the same Kanji. Meanings of each Kanji: “窮 (Kyu)” roughly means “ultimate”, or when used as a verb “to go and seek for the ultimate edge”. “理 (Ri)” roughly means “the reason” or more philosophically “the rule in the universe”. The combined word “窮理” can mean a concept of Chinese philosophy that indicates human kind’s efforts to grasp the ultimate rule of this universe. Pre-modern Japanese scholars adopted this word to translate the western concept of physics, so once it was called “窮理学 (Kyuri-gaku. ‘学’ means ‘science’)”. In contemporary Japanese it is called “物理学 (Butsuri-gaku. ‘物’ means ‘material’”. And “心 (shin)” means “heart” or “mind”. Kanji of “心” expresses the shape of our internal organ that sends blood throughout our body. Lastly, we also tried to express his family name in Kanji too. It is on the last line in the left – “玄人”. It reads “Kuroto”. It indicates his name, but it also has a meaning in Japanese language. “玄人 (くろうと, kurouto)” means “a person of the dexterity / the skilled”…! On July 19th of 2014 I created a new kanji word for him. It is “世解人 (Sekai-jin/Yotoki-bito )”. You can read it as you like. The kanji character “解” can have various meanings when it is added to other character. “解明 (kaimei)” – roughly means “(clear) explanation”. “解説 (kaisetsu)” – roughly means “explanation”. These words all indicate what he is, I think. He is “世解人 (Sekai-jin)” – a man who acts worldwide in order to solve problems. 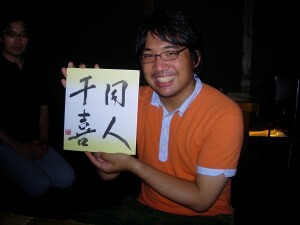 And he is “世解人 (Yotoki-bito)” – a man who explains answers for questions in this world. © 2019 JITEN BLOG. All Rights Reserved.